Introducing stress to a firearms practice program can help inoculate shooters against stress and preventing panic. Those who consistently train outside their comfort zones will be better able to handle the stress brought about by competition, and even deadly force encounters. Also see: Handgun Laser Myths... Busted! There are several methods that shooters can use to artificially replicate or heighten stress during training. Which training method to use is many times dictated by the location of the practice. While some methods (like the one we describe in the article about shooting with your weak hand) can be use broadly, some training methods are not conducive to certain locations. Some more common methods law enforcement officers use in training to increase stress levels include: physical exertion / cardio and strength training exercises, use of a shot timer, competition between officers, the Dieter Drill (or Hood Drill), and reality-based training employing the use of airsoft, paintballs, or Simunitions® weapons, all the way to more complex simulators, like the Virtra System. Whatever method is used, it is critical that proper safeguards are identified and followed. Increasing physical exertion, using a shot timer, and creating competition are some basic methods for increasing a shooters stress level. By physically exerting oneself, the end result is an increase in heart rate. This increase mimics the physiological symptoms of stress. The shooter must learn to control their breathing and discharge their firearm during naturally occurring pauses. If they dont, their shot placement will suffer. Physical exertion is the least effective method. Even though it replicates an increased heart rate, it fails to affect the mindset to the degree of truly stressful events. Shot timers cause stress for the shooter because of personal expectations to succeed. The stress of being timed caused shooters to rush their shots leading them to shoot faster than their capabilities. Keeping a written record of speed and accuracy will document long-term improvement. Shot timers are only effective if the users are willing to push themselves. If you are a competitive person, you will most likely feel stress when set against another shooter. If you are significantly better than the other shooter, the stress may arise from fear of losing to that person. If both of you are equally skilled, you want to prove you are better. Even if you are a novice shooter, competition increases stress because of your desire to beat someone you know is more experienced than you. Each of these scenarios impact a shooters mindset to one degree or another. When shooters cannot control their physical reactions to stress, they are likely to face a mental breakdown and choke. Competitions need not be informal, the formal competitions area just as stressful. Formal competitions may be more stressful if onlookers create stress for the shooter. Besides the aforementioned training methods, there are two training methods, which are particularly suited to induce stress. They are trends that most law enforcement trainers are implementing in any lethal, less lethal or physical encounters courses because they are proven to be effective. It should be noted that these methods require guidelines and instructors to assist in ensuring the safety of all participants. These drills are commonly referred to as the Dieter Drill (or Hood Drill), and reality-based (or scenario-based) training. The Dieter Drill, named after its, Duane Dieter, is a high stress training method. This drill requires the shooter to be blindfolded or hooded. The shooters stress increases due to the loss of visual feedback. The longer an individual is hooded, the greater the stress they feel. Uncertainty and apprehension increase the shooters stress. They do not know what they will face once the hood is removed. This reaction can be intensified if peers are allowed to observe. When a shooter is blindfolded, a series of targets can be hung down range at varying distances and heights. Targets can be representative of shoot and no-shoot situations. In addition, the range officer can load dummy rounds or varying numbers of rounds in the shooters gun to add additional stress and incorporate failure drills. It is important to orient the shooter before removing the hood, and to make sure they understand that in no way are they to violate the 180 rule based on their starting position. Initially, this drill can be accomplished with airsoft so that range officers can confidently gauge a shooters gun handling skills before giving them a loaded gun. Scenario-based training is another highly effective training method for inducing a stress reaction. The use of Simuntions®, Virtra simulators, airsoft, or paintballs are tools that increase stress on the shooter because if hit, they will experience varying levels of pain. Pain modifies behavior. Simunitions®, Virtra and paintballs offer an advantage over airsoft because the projectile leaves visible marks at the point of impact. Marksmanship skills are typically acquired through the use of stationary targets but it is quite a different experience to have the target (role players) shoot back. 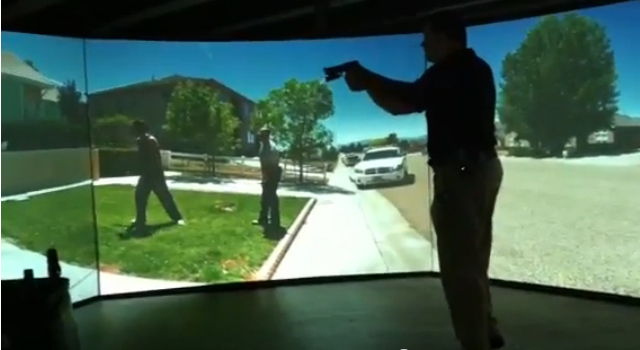 The main goal of scenario-based training is to make use of force decisions under stress but other goals include shot placement and tactics. 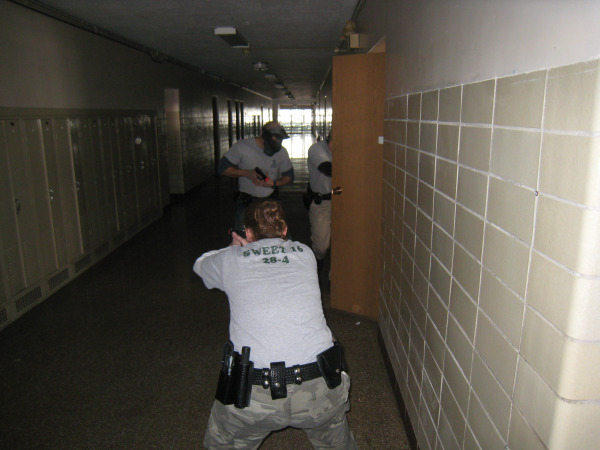 There are several methods of incorporating stress into firearms training. Some of these methods are more effective than others but each one offers a positive benefit for shooters. Whether training to compete, or for self-defense, shooters who train under stress will reap the benefits, thus enabling them to cope with any situation.